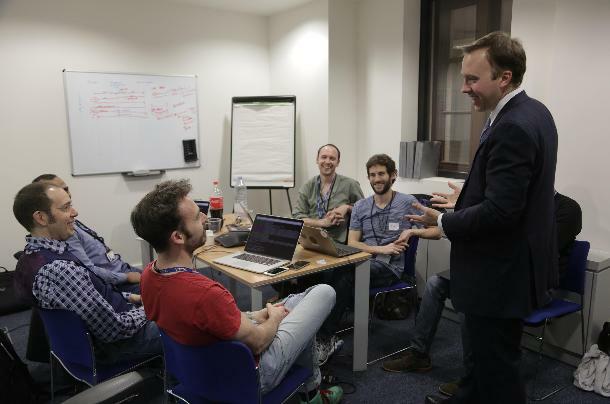 Last week, GDS hosted a hack day for developers from across government. We welcomed about 30 developers to the Cabinet Office to test out some of the new Government as a Platform components that we’ve been working on over the last few months: GOV.UK Pay, GOV.UK Notify, and Government PaaS. Representatives from digital service teams from all over the country got together to try integrating with our new products. It was a fantastic opportunity to get feedback from one of our main groups of users, to see whether we’ve been heading in the right direction. 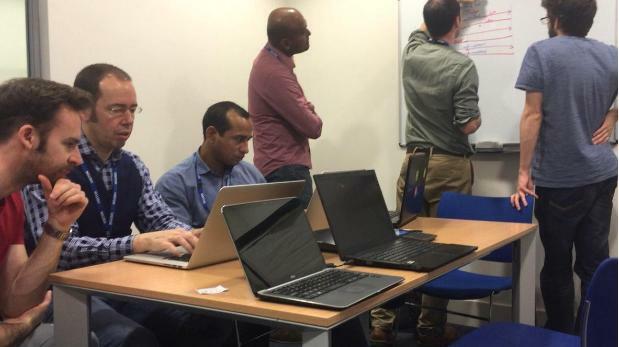 The developers who attended are all from services that have worked with GDS to identify the user needs for GOV.UK Pay, GOV.UK Notify and Government PaaS. 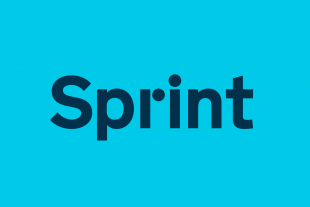 The hack day was a chance for them to build their own mock services to integrate with GOV.UK Pay to take a test payment, then use GOV.UK Notify to send out an electronic payment confirmation automatically. Once they’d done that they could experiment with hosting their service with Government PaaS. We’ve worked hard to design the APIs - sets of requirements that govern how one application can talk to another - for GOV.UK Pay to be as good as possible. We’ve also thought a lot about producing great documentation that should make the process even more straightforward. The good news is that developers using a range of stacks - Java, Node.js, Python, and Scala - all succeeded in integrating with GOV.UK Pay and taking a test payment in only a few hours. Some of the teams got as far as using GOV.UK Notify, and a few experimented with Government PaaS. This was a great result. It showed the low technical barrier to adoption of these new cross government components. It made clear just how much time will be saved by building reusable components that any public service can use, rather than expecting individual services to tackle payments or notifications on their own. Of course, not everything went perfectly. This was the first time that we’d let more than a handful of our own developers loose on our code. Some things broke. Which in some ways is what we wanted to happen. We learnt a lot about how we can improve our account creation process, increase the robustness of our systems as we move closer to taking real payments later in the year, and identified a number of bugs that need fixing. We had lots of feedback from attendees; some of it about what was already good, and some, even more usefully, about what we could do better. It was gratifying that the draft GOV.UK Pay documentation got some love, but there were still areas for improvement and each of the GDS teams left with work to do. This hack day is a great example of government embracing ways of working we’d usually associate with innovative startups to make sure we deliver on the Government as a Platform vision. Working together like this, across government, will help us recast the relationship between the citizen and the state. And we plan to continue doing just that. If you’re a developer interested in joining GDS and doing work that matters, check out our current GDS vacancies. We hope this will be the first of many hack day events as we continue to work with our partners across government to digitally transform the delivery of public services. Follow Rory on Twitter and don't forget to sign up for email alerts. Nice work! Last year we did the same thing: an after hour’s hackathon on 3 of our, as we call it, engines (backend modular common software components). We hacked for a whole week (a HackaWeek) on our newly launched notifications engine, the multilanguage engine and our API-manager. With stunning results and a lot of ideas to improve our future path. Soon we will hack on 7 additional engines including a payment engine. So we are pretty much on the same track. Except for the minister. He didn’t pass by. Instead we saw another important person every evening: the pizza delivery boy ;). Is there a similar documentation for Notify Platform publicly available? @jano - The notify API's are all coded in the open here https://github.com/alphagov/notify-api - README.md documents some of the API at a basic level but it's still in Alpha so more than likely ready to change. @GDS - Great stuff on the hack day, be lovely to see one outside of London.